Had your eye on an AirPlay accessory for your iPhone or iPod touch? Well, Pioneer is looking to help you pull the trigger on one. The company has announced a new set of AirPlay Music Tap systems that enable access to your music library without being chained to a peripheral. By connecting one of these bad boys to your home WiFi or ethernet network, you'll be able to access your entire iTunes library in various locations throughout your home -- 'course, having Apple's free Remote app will ensure maximum utility. Other features include a 2.5-inch full-color LCD display, Pandora, iHeartRadio, vTuner internet radio and Air Jam, which allows for playlist sharing on your arsenal of the company's Music Tap systems. When this pair drops in October, you'll have your choice of the X-SMC-3-S for $400 or the more dapper, bluetooth-enabled X-SMC4-Elite for $480. You can take a peek at the Elite, along with the full PR, after the break. Pioneer Electronics (USA) Inc. today expanded its family of Apple AirPlay®-compatible products with the launch of two networked AirPlay music systems called Music Tap. Available in Pioneer ($399) and Elite® ($479) branded models, the Music Tap systems offer music lovers more ways to access and enjoy their music throughout their entire home regardless of where or how the music is stored. With AirPlay, enthusiasts have complete access, control and playback of their entire iTunes music library through their Music Tap system connected to the home network, wirelessly or using Ethernet. Both Music Taps feature built-in WiFi™ to enable wireless music connection using AirPlay, DLNA® 1.5, vTuner™ Internet radio, Pioneer's proprietary AirJam1 app for iPhone®, iPod touch® and iPad® and a 2.5-inch full-color LCD display. "By incorporating AirPlay into more of our product lines, first with audio/video receivers and now with Music Tap, Pioneer is making it possible for consumers to quickly access and listen to their iTunes® music library throughout the home," said Chris Walker, director AV marketing and product planning for the home entertainment division of Pioneer Electronics (USA) Inc. "These new systems are great additions to any room or office. Although they're compact, they produce 'larger-than-life' sound, and because both models are also equipped with a wireless connection, multiple units can be easily placed in different rooms." * Music Tap systems enable users to quickly and easily enjoy all their music content with song information and album art simultaneously displayed on a connected monitor/TV. AirPlay requires iTunes 10.1 or later, or iPad, iPad 2, iPhone 3GS, iPhone 4, iPod touch (2nd, 3rd or 4th generation) with iOS 4.2 or later. Using Apple's Remote app on iPad, iPhone or iPod touch also enables users to control, browse and access their iTunes music library on a Mac or PC and play it through Music Tap. Apple's Remote App is available for free from the App Store on iPad, iPhone or iPod touch at www.iTunes.com/appstore/. * Connection to Music Streaming Services – In addition to the music saved in an iTunes library, the Music Tap systems support AirPlay-enabled apps like PANDORA® Internet radio, iHeartRadio® and other music streaming service apps, giving consumers access to a virtually endless playlist. * Crystal Clear Sound – Music Tap's Apple Lossless capability ensures that users will always enjoy high-quality audio with no degradation in sound quality when listening to music encoded with this high-resolution format. * Music Throughout The Home – Music Tap is a great addition to an AirPlay-enabled Pioneer AV receiver for music in any room of the house. Using iTunes 10.1 or later on a Mac or PC, users can wirelessly stream their music to multiple Music Tap systems throughout the home. * DLNA 1.5 Certified – Music Tap's DLNA 1.5 Certification allows consumers to stream their music wirelessly via a home network from any DLNA 1.5 Certified device. Users can conveniently enjoy high-resolution audio playback with support for FLAC and WAV files from DLNA certified networked device in the home. * vTuner™ – Pioneer adds vTuner Internet radio to Music Tap for endless music entertainment. With vTuner, users have access to more than 16,000 Internet radio stations around the world. From the on-screen display, users can choose from different genres, station locations or simply search for specific stations. * Air Jam – First introduced as a feature in its line of AV receivers, Pioneer's free Air Jam app is also available in the Music Tap systems (optional AS-BT200 Bluetooth adapter required for the Pioneer model). The Air Jam App is available from the App Store on iPad, iPhone or iPod touch or at www.iTunes.com/appstore/and connects up to four Apple devices via Bluetooth® to create a collective playlist for playback on Music Tap. Once linked, each user can cue songs from their own music libraries to create the shared playlist. Each connected device also displays the list of songs added by all users and which device a song plays from. The Air Jam App conveniently stores the lists of songs created for each session for future purchases at the iTunes Store. * The Music Tap systems are "Made for iPhone and iPod" and come with an integrated pop-out dock for playback and charging. * For a high quality listening experience, the music systems are equipped with a 2-channel digital amplifier to deliver clean and powerful audio to any room. Dual full range drivers in a passive radiator enclosure produce clear crisp high frequencies complemented by deep, accurate bass. The Pioneer Elite model has been tuned by Pioneer's renowned TAD director of speaker engineering, Andrew Jones. In addition, the Elite model incorporates built-in Bluetooth and includes a two-year warranty. * Both AirPlay music systems offer an auxiliary input for connecting other audio devices with a mini jack (headphone) output. For added convenience, both models also feature a USB port located in the front of the system. USB devices such as hard drives, thumb and flash drives with MP3, WAV, WMA, AAC LPCM, and FLAC files can all be accessed using the included remote control. For added convenience, both systems feature a control app for iPod touch, iPhone and iPad, available on the App Store. 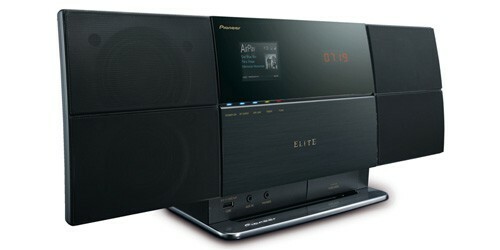 Pioneer Music Tap systems will be available to consumers in October 2011.